TM is a real-time, non-relocating, conservative, allocator using type- and color-segregated lists, based on Henry Baker’s “Treadmill” allocator. The source code for TM is located at https://github.com/kstephens/tredmill. TM interleaves marking, scanning and sweeping during each mutator’s call to tm_alloc(). TM attempts to limit the amount of work in the collector to avoid stopping the world for long periods of time. It does not require a separate thread for the collector as all collection activities are interleaved with allocation. An allocation unit is a tm_node. Each tm_node is allocated from a block of system memory (tm_block) sized and aligned to a multiple of the operating system’s page size. Each tm_block is dedicated to a particular type (tm_type). Each tm_type represents a tm_node allocation size, thus each tm_block is uniformly parceled into tm_nodes of the same size. In general, each power-of-two size has a tm_type. However, tm_types can be created for any size. tm_GREY: allocated, marked used, not scanned for pointers. tm_BLACK: allocated, marked used, scanned for pointers. Each tm_type has it’s own tm_WHITE, tm_ECRU, tm_GREY, and tm_BLACK doubly-linked lists. Each tm_node is a member of one, and only one, of its type’s color lists. To keep the tm_node header small, the node’s color is encoded in the lower two bits of the tm_node._prev pointer. When a tm_node’s color changes, it is moved to a different colored list in its tm_type for processing in a different allocation phase. Node types can be explicitly created for common sizes that are not a power of two, to reduce memory fragmentation. tm_UNMARK: Allocate tm_nodes from the tm_type’s tm_WHITE list until it is empty. A fixed number of tm_BLACK nodes are returned to the tm_ECRU list. Memory pressure may cause switching to the tm_ROOT phase. tm_ROOT: A fixed number of roots are scanned for pointers into allocated space. tm_ECRU nodes with valid references are moved to tm_GREY. After all roots are scanned, the next phase is tm_SCAN. tm_SCAN: A fixed number of node bytes of tm_GREY nodes are scanned for interior pointers and moved to tm_BLACK list. Once all tm_GREY nodes are scanned, the next phase is tm_SWEEP. tm_SWEEP: If there are no more nodes to be scanned, sweep a fixed number of tm_ECRU nodes to the tm_WHITE list. Once all tm_ECRU nodes are sweeped, the collector returns to the tm_UNMARK phase. In general, newly allocated tm_nodes are taken from the tm_type’s tm_WHITE list and placed on its tm_ECRU list. If the type’s tm_WHITE list is empty, an allocation tm_block is requested from the operating system and is scheduled for parceling new tm_WHITE nodes for the type. If the allocation tm_block becomes empty, the process is repeated: another allocation block is requested and parceled. A limited number of new free nodes are parceled from the type’s current allocation block as needed and are initialized as new tm_WHITE nodes. New tm_blocks may be requested from the operating system during all phases, if the type’s tm_WHITE list or allocation block is empty. The reasoning is the operating system should be able to allocate a new allocation block faster than a collection that would need to completely “stop the world”. All phases, except the tm_SWEEP phase, allocate nodes by moving them from the tm_WHITE list to the tm_ECRU list. 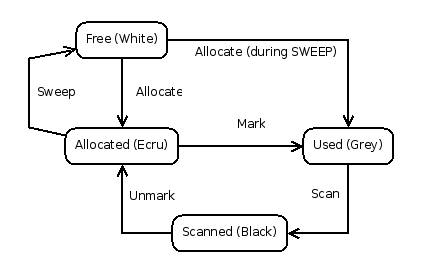 The tm_SWEEP phase allocated nodes from tm_WHITE to tm_GREY, because tm_ECRU nodes are considered to be unmarked garbage during the tm_SWEEP phase and tm_BLACK nodes are considered “in-use’ but are not scanned for interior pointers during the tm_SWEEP phase. Using tm_GREY during tm_SWEEP is also related to tm_BLACK node mutation, which gives rise to requiring a write barrier on tm_BLACK nodes. The tm_SWEEP phase will always attempt to scan any tm_GREY nodes before continuing to sweep any tm_ECRU nodes. The tm_BLACK color might seem a better choice for tm_SWEEP allocations, but this would force young nodes, which are more likely to be garbage, to be kept until the next tm_SWEEP phase. Coloring tm_SWEEP allocations tm_BLACK would also prevent any new interior pointers stored in nodes that may reference tm_ECRU nodes from being scanned before tm_SWEEP is complete. To prevent thrashing the operating system with tm_block allocation and free requests, a limited number of unused blocks are kept on a global free list. Aligned blocks allow determining if generic word is a pointer to heap-allocated tm_node to be computed with simple pointer arithmetic and a bit vector check. Checking a bit vector indexed by the pointer’s page number. The bit is set when tm_nodes are parceled and cleared when the entire tm_block is unused and returned to the free block list or operating system. Mask off the insignificant page bits to construct an aligned tm_block address. Determine the size of tm_nodes in the tm_block from the block’s tm_type. Determine if the pointer resides in the data portion of the tm_node by considering the tm_node and tm_block linked-list headers to be “holes” in the address space. Nodes are segregated by type. Each type has a size. By default, type sizes are rounded up to the next power of two. A specific allocation type can be requested with tm_adesc_for_size(). The allocation descriptor can then be used by tm_alloc_desc(). The opaque element can be used to store additional mutator data. Each node type has its own colored lists, allocated block lists and accounting. Segregating node types allows allocation requests to be done without scanning tm_WHITE nodes for best fit. However, since types and the blocks are segregated, and nodes of a larger size are not scavenged for smaller sise, this could least to poor actual memory utilization in mutators with small numbers of allocations for many sizes, since a single node allocation for a given size will cause at least one block to requested from the operating system. The color lists are logically combined from all type for iteration using nested type and node iterators. During the tm_SCAN and tm_SWEEP phase, any tm_BLACK node that is mutated must be rescanned due to the possible introduction of new references from the tm_BLACK node to tm_ECRU nodes. This is achieved by calling tm_write_barrier(&R) in the mutator after modifying R’s contents. tm_write_barrier_pure(R) can be called when R is guaranteed to be a pointer to the head of a node allocated by tm_alloc(). tm_write_barrier_pure(R) cannot be used if R might be an interior pointer or a pointer to a stack or root-allocated object. tm_write_barrier(R) should be used if the address of R is not known to be a pointer to the heap, the stack or global roots. If R is a pointing into global roots, tm_write_barrier(R) will cause global root rescanning, if the collector is in the tm_SCAN phase. Stack writes are not barriered, because stack scanning occurs atomically at the end of tm_ROOT. When entering code where the write barrier protocol is not followed, tm_disable_write_barrier() can be called to put the collector into a “stop-world” collection mode until tm_enable_write_barrier() is called. A virtual memory write-barrier based on mprotect() might be easier to manage than requiring the mutator to call the write barrier. Recoloring and marking root set pages can be done in hardware assuming the overhead of mprotect() and the SIGSEGV signal handler is low when changing phases and colors. TM is not currently thread-safe. TM does not currently support allocations larger than a tm_block. This will be fixed by using another page-indexed bit vector. A “block-header-in-page” bit vector marks the page of each tm_block header. This bit vector will be scanned backwards to locate the first page that contains the allocation’s block header. TM does not currently support requests for page-aligned allocations. This could be achieved by using a hash table to map page-aligned allocations to its tm_block. This entry was posted in C, Garbage Collection and tagged garbage collection on 2008/01/14 by kurt.